The 17 pounder anti-tank gun was a very powerful gun but also very large and heavy and could only be moved about the battlefield by a vehicle. This meant that it was more effective in defence than in the attack. Therefore there was the intention to mount it on a vehicle to give it more mobility. The Churchill tank had been trialled as a self-propelled gun; the "3-inch Gun Carrier". The US was expected to be able to provide the M10 Wolverine through Lend-lease. However other projects were under consideration using otherwise obsolete tank chassis. These included the Valentine for its low profile and reliability and the Crusader for its good power-to-weight. The Valentine chassis was soon chosen for this role, as it was in production but rapidly becoming obsolete as a tank in British use. The engine had a higher power rating than in the Valentine. It was also one of the few chassis that could accommodate such a large gun. 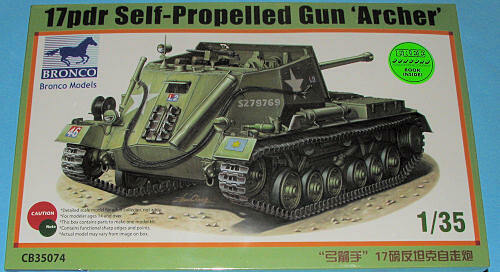 In separate development were tank designs using the 17 pdr - this would lead to the Cruiser Tank, Challenger a derivative of the Cromwell and the Sherman Firefly conversion of Sherman tanks. The Valentine had a relatively small hull and it was not possible to use a turret. Instead the gun was mounted in a simple low open-topped armoured box with gun barrel to the rear. This kept the overall length of the Archer short. However, this meant that on firing the gun breech recoiled into the driver's space. The driver stayed in position though in case the vehicle needed to move quickly. The rear mounting at first seemed like a liability, but it was soon made into an advantage. Combined with its low silhouette, the Archer made an excellent ambush weapon, allowing its crew to fire off a few shots, then drive away without wasting time turning around. Bronco continues with its superlatively molded kits with this most unusual British tank destroyer. Trust the British to mount things 'backwards', but I have admit that is it very much an inspired way of doing things. 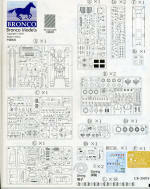 Typical of Bronco, the kit offers everything you'd need to turn out a quality product. 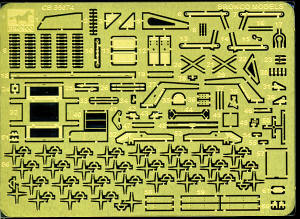 The kit includes what is now obligatory in high end kits with a nicely done photo etch fret a nd several sprues of track links. These links are designed to snap together so construction should move along rather quickly once all the little sprue pips are cleaned off. Still, with 18 of these track sprues, it will be a bit time consuming. Something that will help with painting is that the road wheels have separate tires. These are cemented between the two wheel halves. The kit also provides optional parts for the early or the late version. These are clearly shown in the instructions. The engine radiators are hinged as on the actual vehicle to provide access to the engine, something that is a nice touch if one wants to build the kit as if under maintenance. In the fighting compartment are full racks of shells, each with a pair of photo etch handles that are used to pull them out of the rack for use. These are individual shells so one does not have to have all the racks full. Complete shells are also part of the kit. So detailed is this one, that there are separate bolt heads and wingnuts attached to the sprues to be cut away and placed in areas where it would be impossible to mold them. Even the machine gun is a little kit in and of itself. Instructions are a 32 page book that provides 42 well drawn construction steps and four full color painting and markings guides. Options are for the Polish 7th Anti-Tank Regiment in Italy during 1943 with what looks like mud applied to the Olive Green paintwork. Another vehicle from the same regiment and time has sections of blue-grey and blue-black painted over the outside. The third option is from the Canadian 3rd Anti-Tank Regiment. No date provided. Finally a 15th Scottish Division from North West Europe in 1944/45 with dark green splotches. A superlative kit of an interesting British subject. I'm pleased to see Bronco spending the time and effort to kit such vehicles as it makes a welcome break from Shermans and Germans. 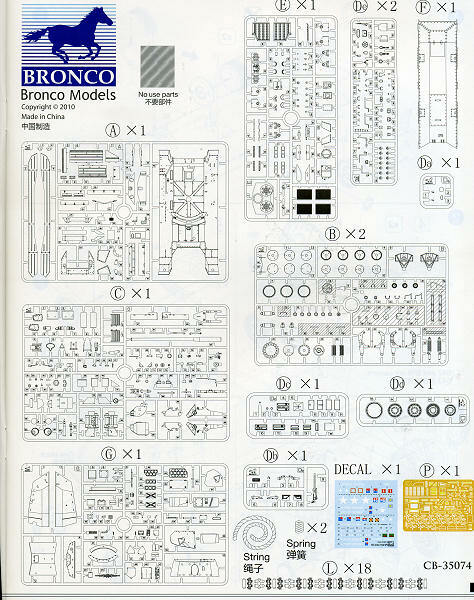 The detail level of this one is unmatched and while not a quick build by any means, will produce an exceptional model. If you would like your product reviewed fairly and quickly , please contactme or see other details in the Note toContributors.